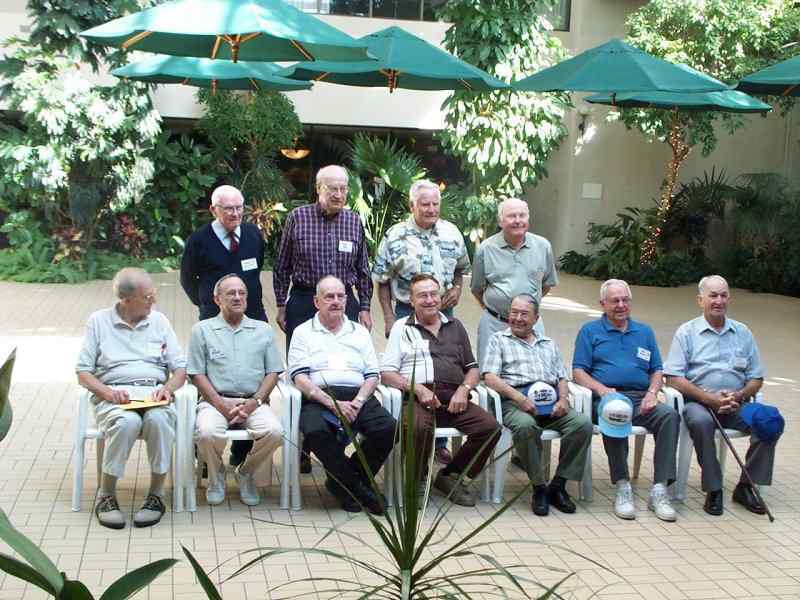 REUNION 2001 A GREAT SUCCESS!! All those who attended will agree, this was one of the best! 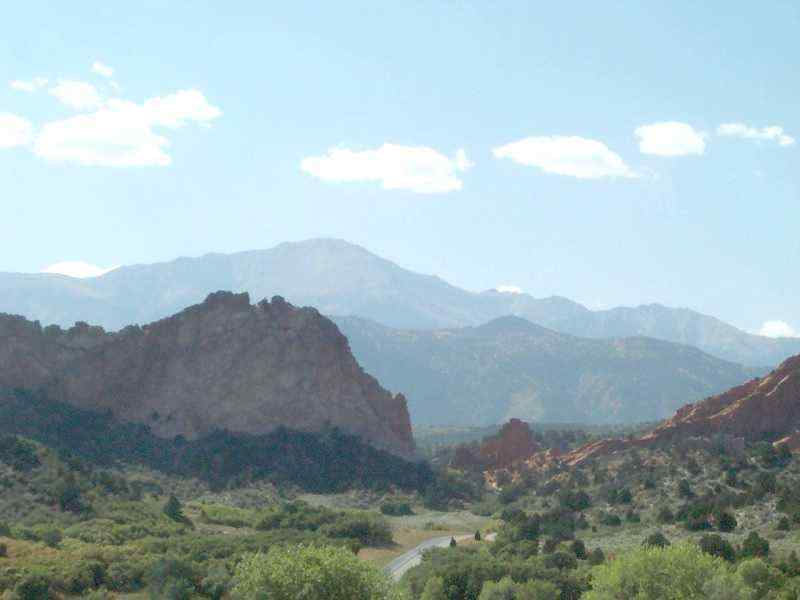 Thanks to our hosts and to everyone who shared the time in Colorado Springs. 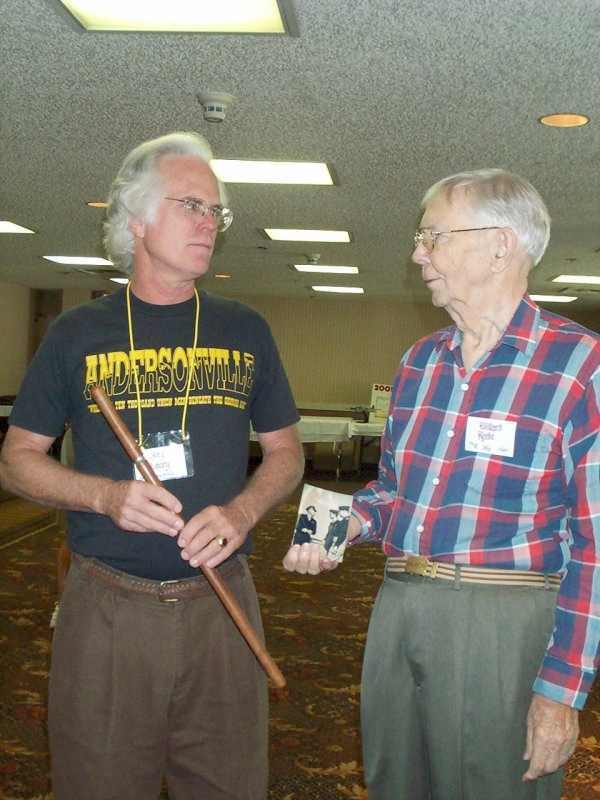 These are personal snapshots: if you have captions or names to add please send them to us.  If you have photos of your own to submit, contact the webmaster . 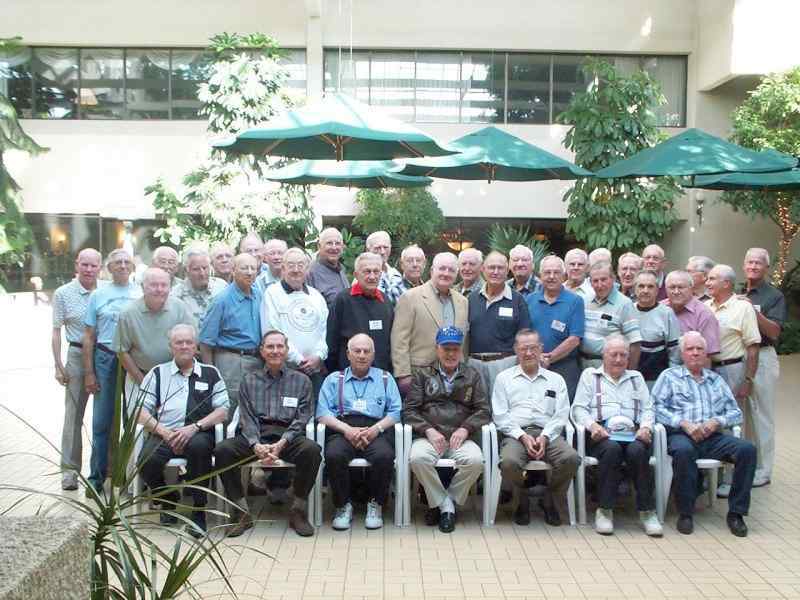 We hope to post the Official Squadron Photographs taken by the professional photography team, within a few weeks. These following photos were all taken by Diane Reese. 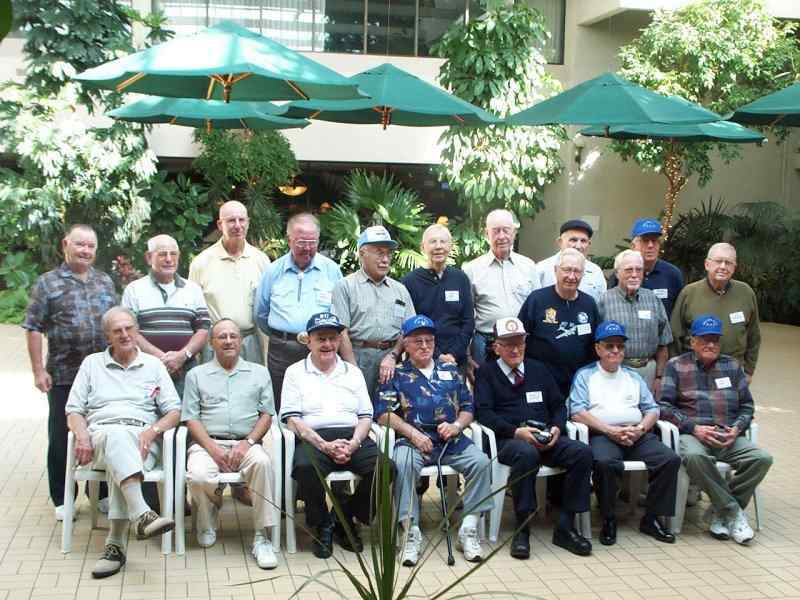 A gathering of the 748th Squadron in the hotel atrium. 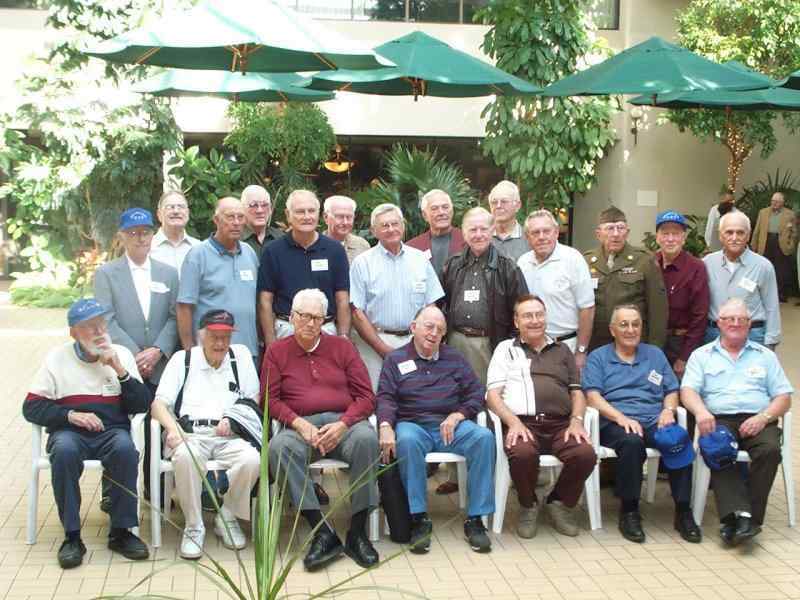 A gathering of the 749th Squadron in the hotel atrium. 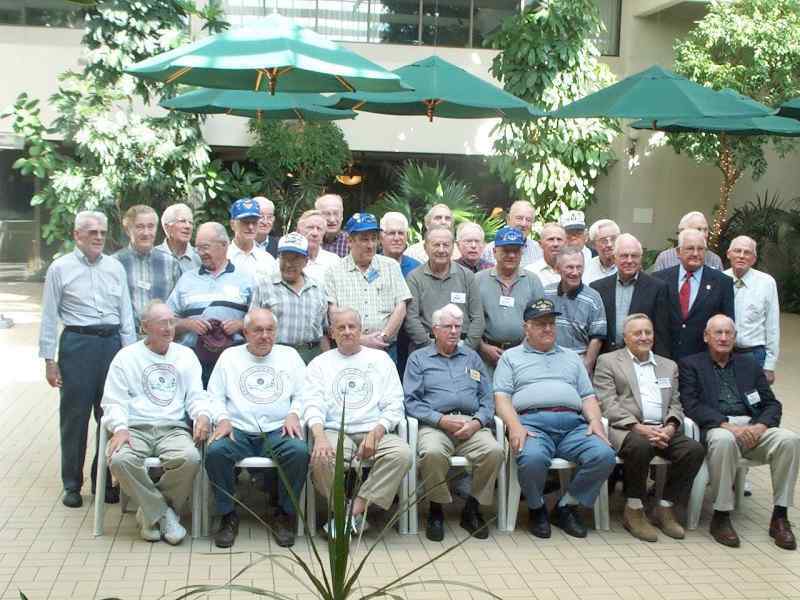 A gathering of the 750th Squadron in the hotel atrium. 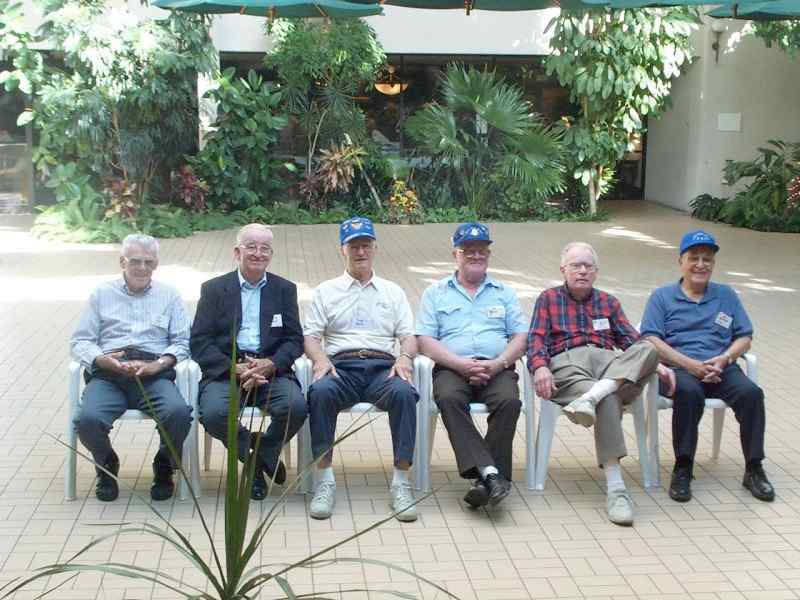 A gathering of the 751st Squadron in the hotel atrium. 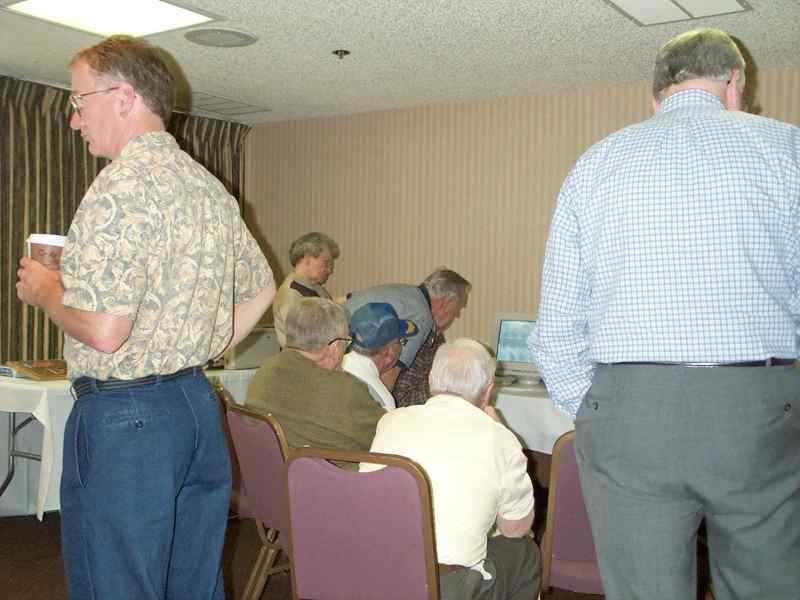 A group gathered around the Association's Website display. 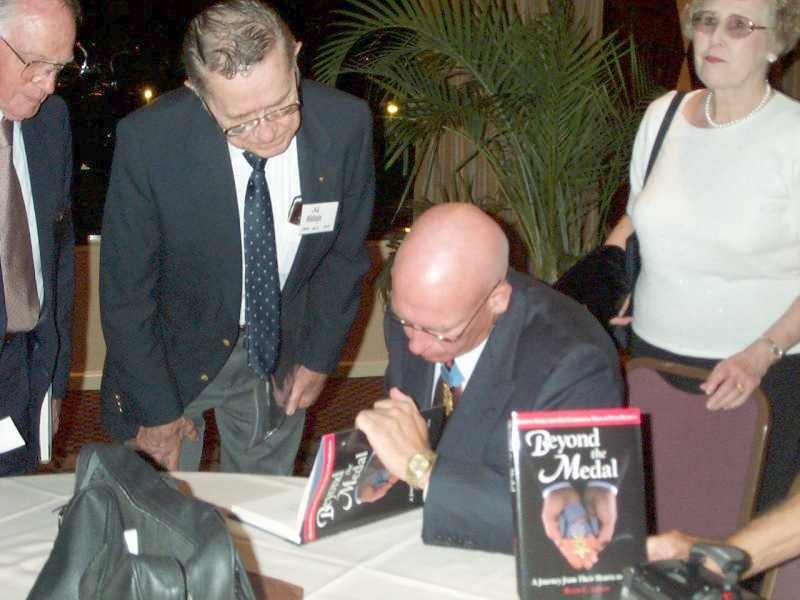 Cliff Digre looking over the shoulder of Willard Reese. 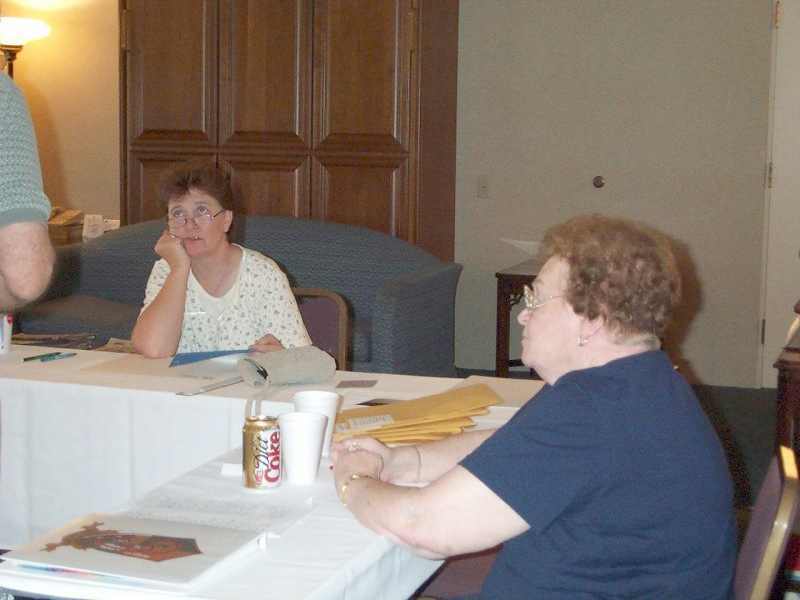 Another view of a group gathered around the Association's Website display. 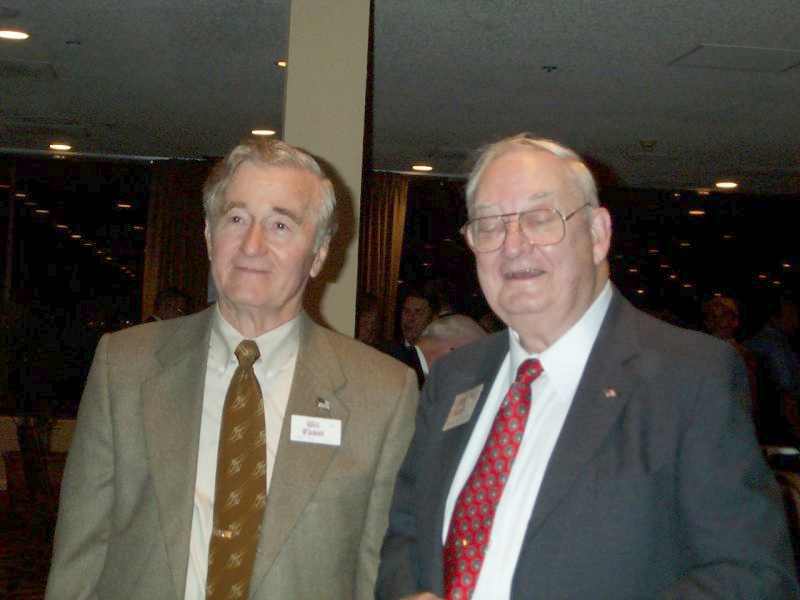 Will Fluman on the left, John Pierson with back to camera and Jim McCloskey seated in green sweater. One of our youngest members and webmaster assistant Gregory Perkins. 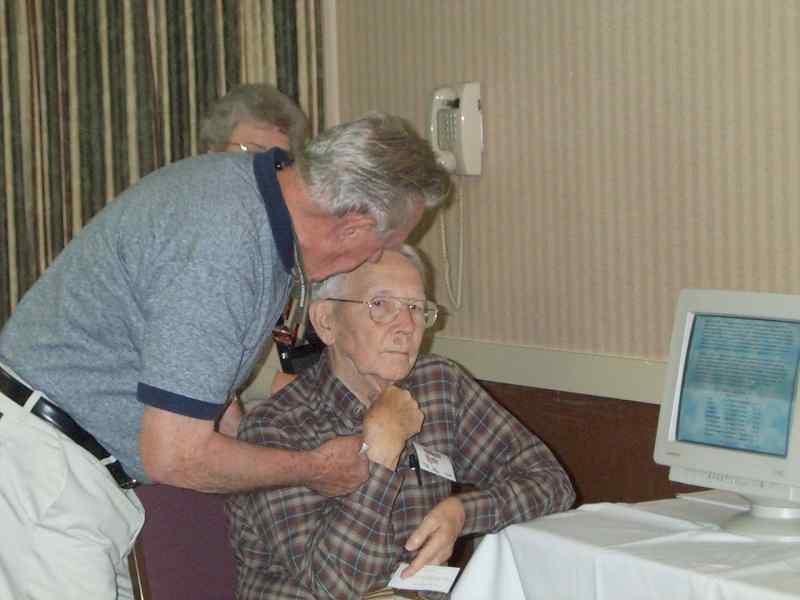 Willard Reese and Cliff Digre discussing the Association's website. 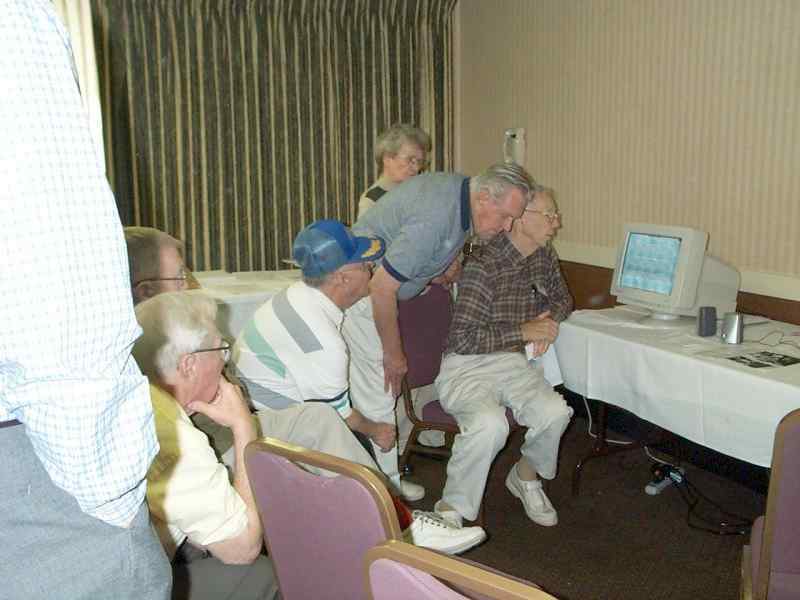 Another gathering around the Association computer, searching for information. 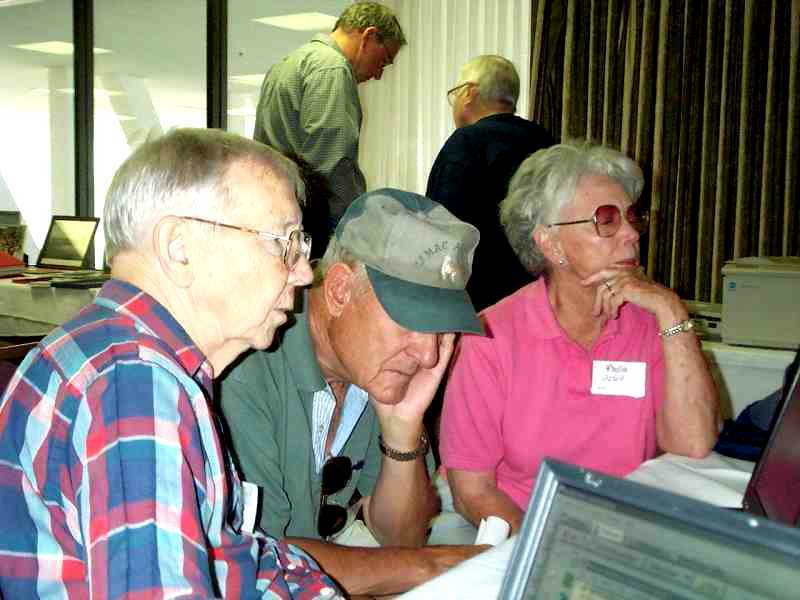 Willard Reese in foreground with Hugh and Phyllis Arnold. 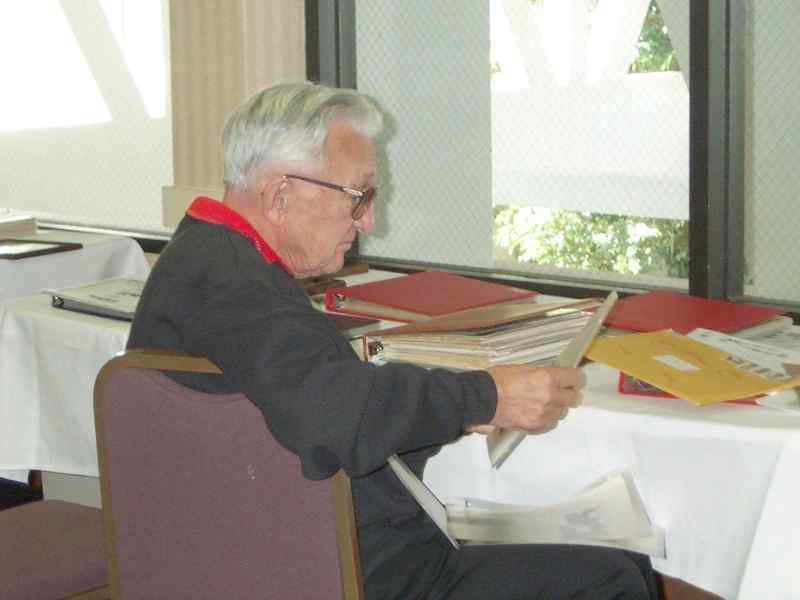 A lone researcher digging out information from the past. 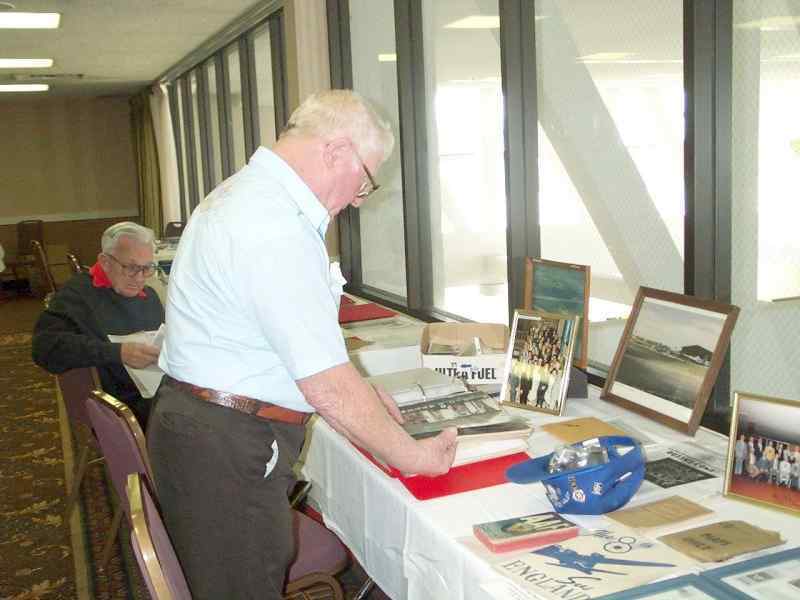 Another veteran perusing a photo album of pictures from the days at Glatton. 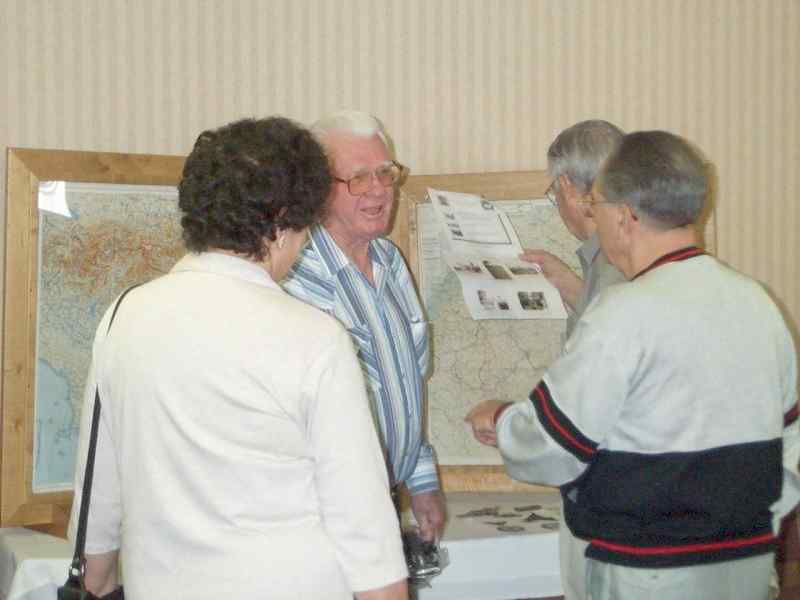 A group studying maps in the Memorabilia Room. 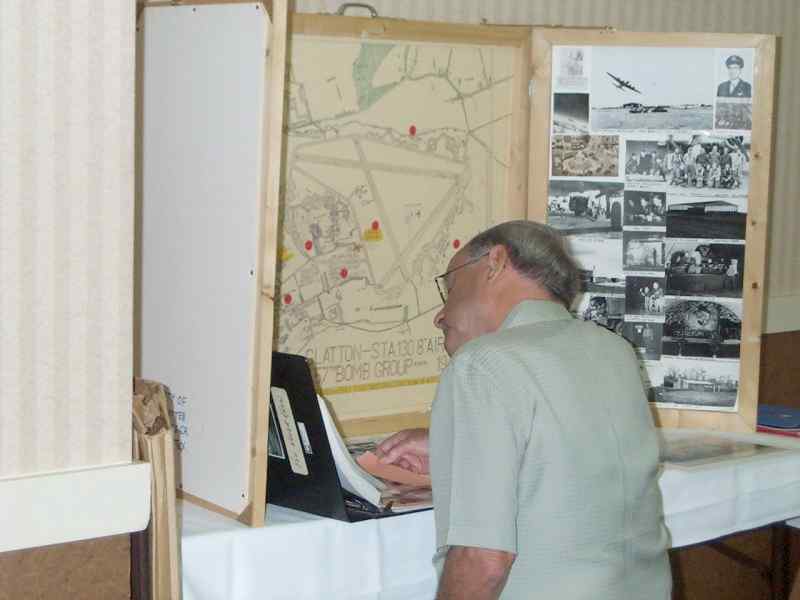 A lone researcher in the Memorabilia Room (Note the layout of Glatton Airbase on the board. 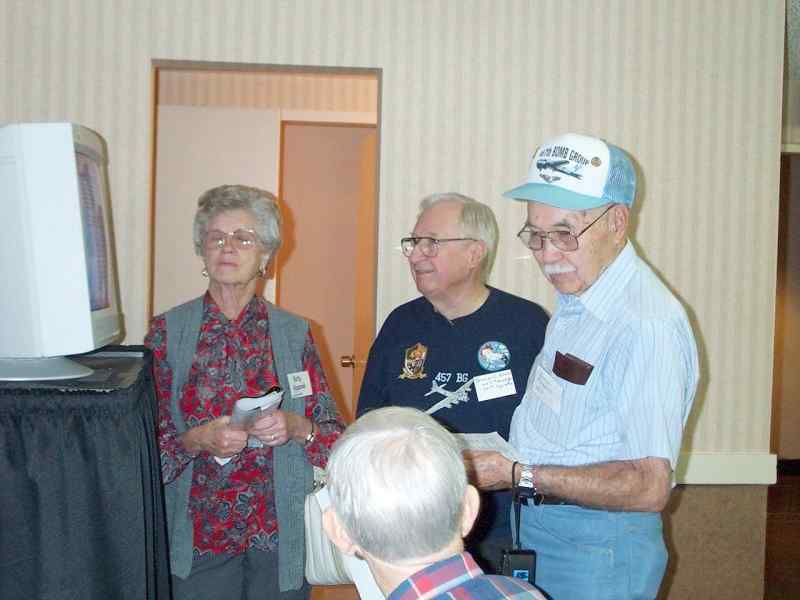 A few members, Betty and George Raymond and George Lewis, looking at the monitor in the Memorabilia Room.. Our Association President, Craig Harris, offering some advice to George Raymond and Willard Reese in the Memorabilia Room. Nancy Hendricks and Jeannie Toth (mother) after a long, hard day. Two dedicated workers. 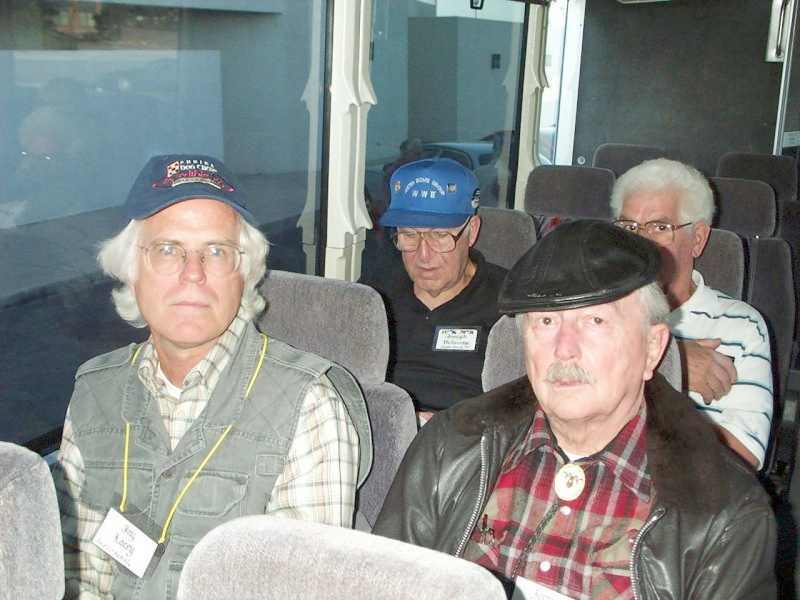 Jay Lacey and brother Jerry Holt (Gen. Lacey's sons) on the bus to Flying W ranch. 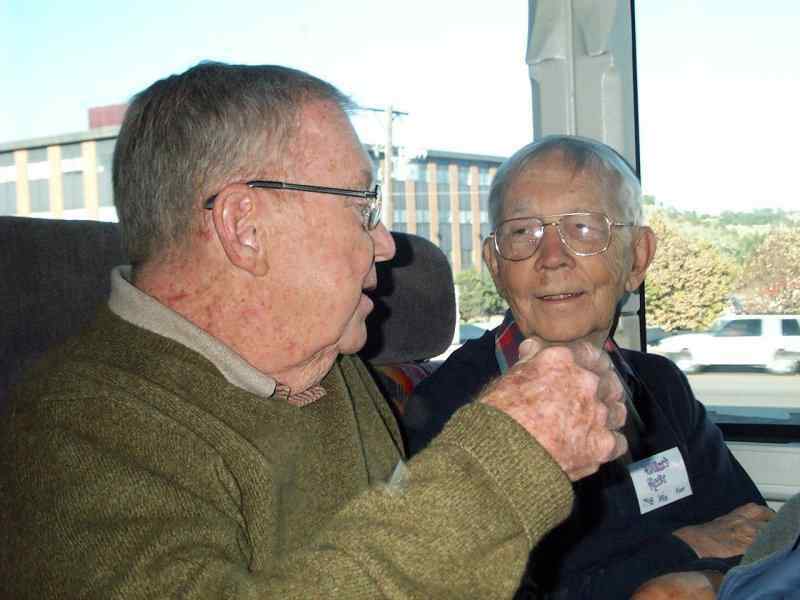 Jim McCloskey and Willard Reese on the bus to Flying W Ranch. 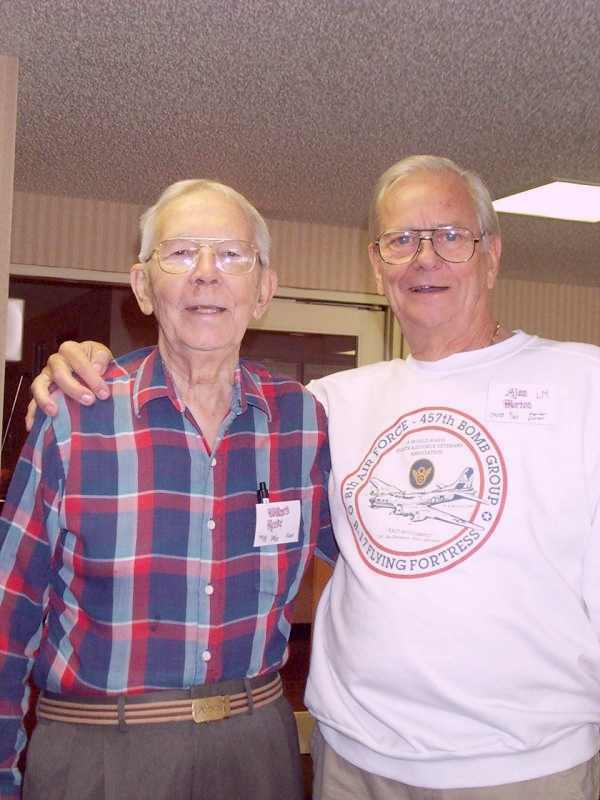 Willard (Hap) Reese and Alan Morton, poised for action. 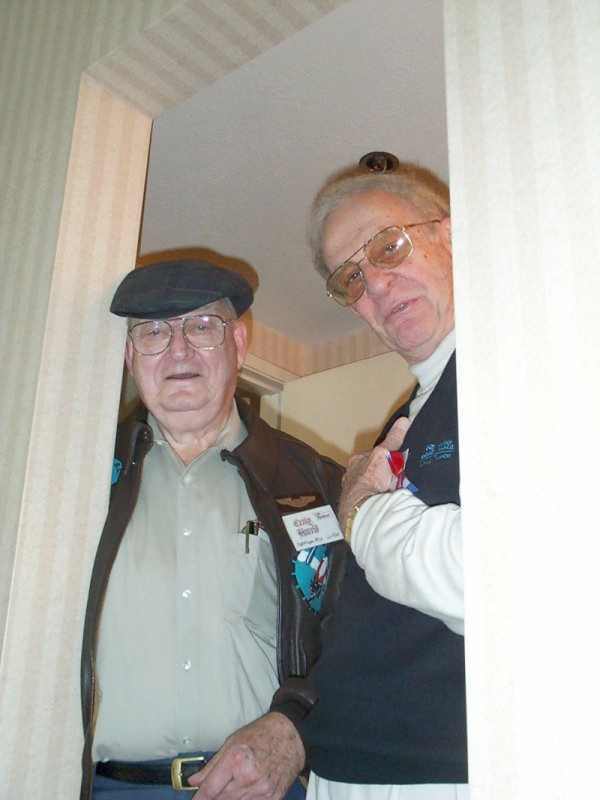 The Dynamic Duo, Craig Harris and Lee Zimmerman, checking up on things. 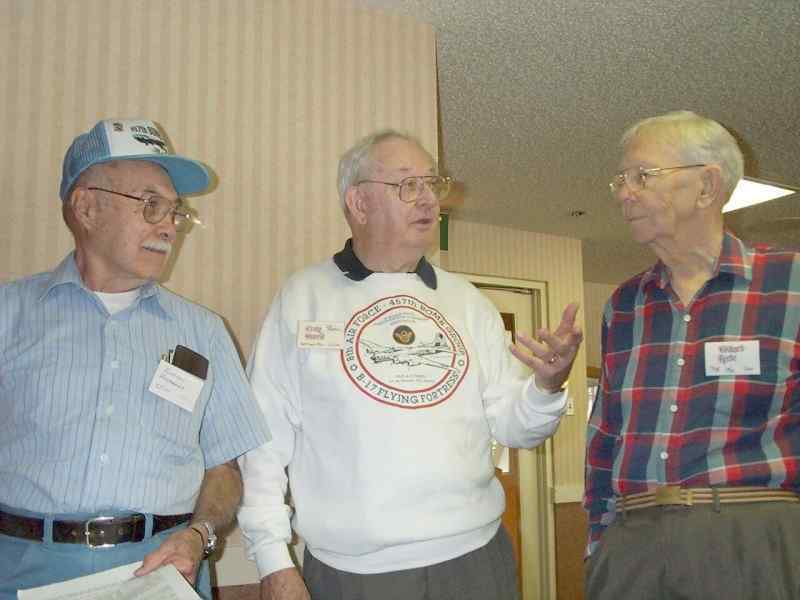 Jay Lacey and "Hap" Reese posing as General and Luper (In Photo) A happy group gathered in the hotel bar (Rickenbacher Room). 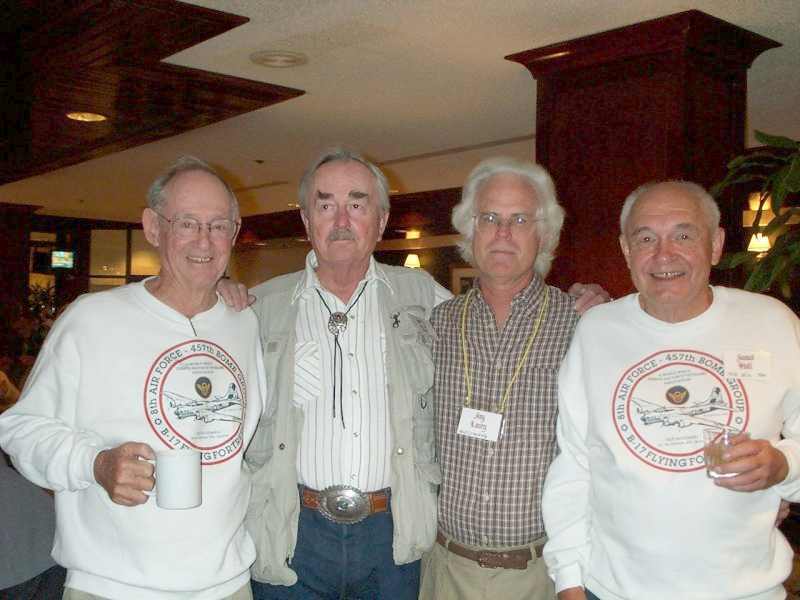 Wayne Dykes, Jerry Holt and Jay Lacey and James Hall celebrate. 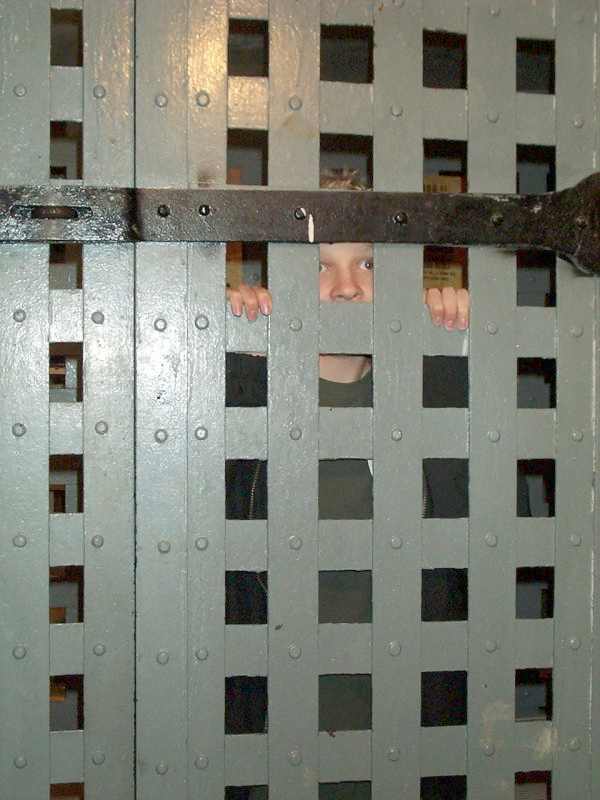 Gregory Perkins in the lockup at the Flying W Ranch. A view at dusk looking out one of the windows that surround the ballroom. The family of Willard (Hap) Reese + one in the atrium. 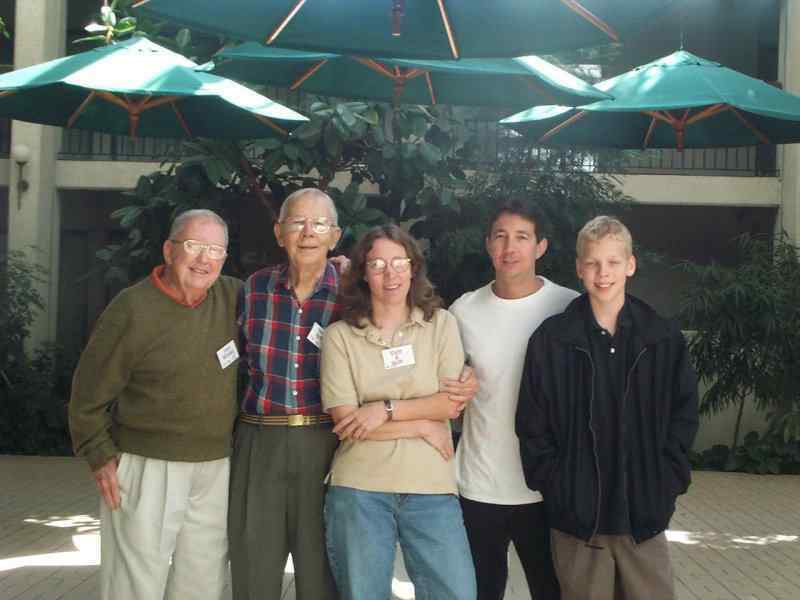 Jim McCloskey, Hap, Diane, and David Reese and grandson Gregory Perkins. 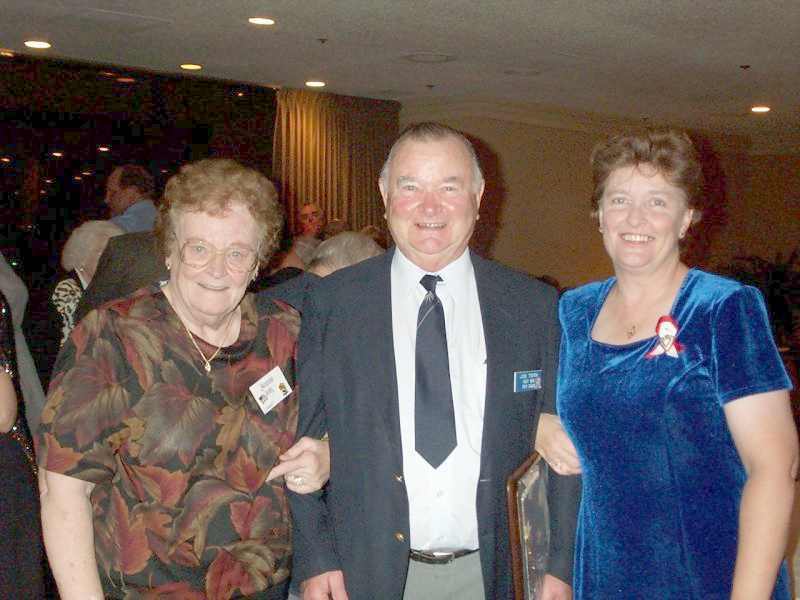 Jeannie and Joe Toth and their daughter Nancy. 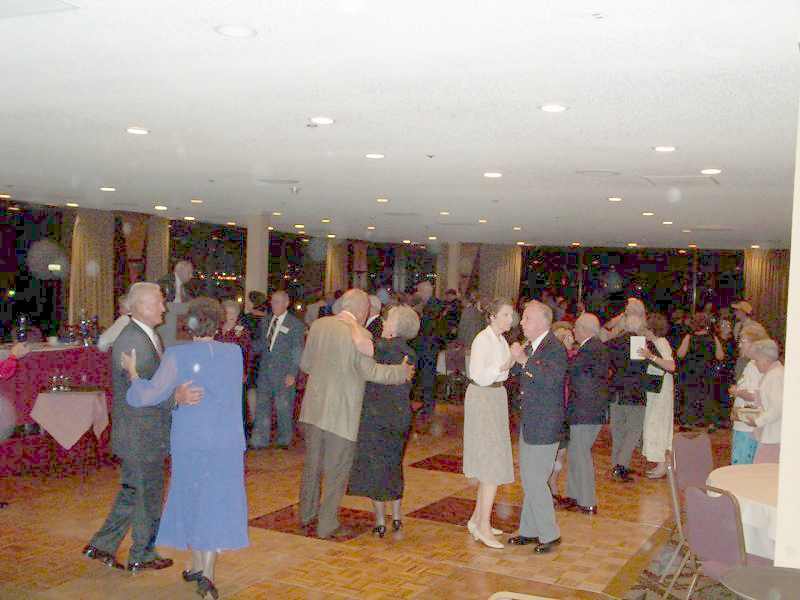 This trio organized our successful Reunion - 2001 Dancing after dinner. The couple in the right foreground are Arden and Ken Blakebrough. 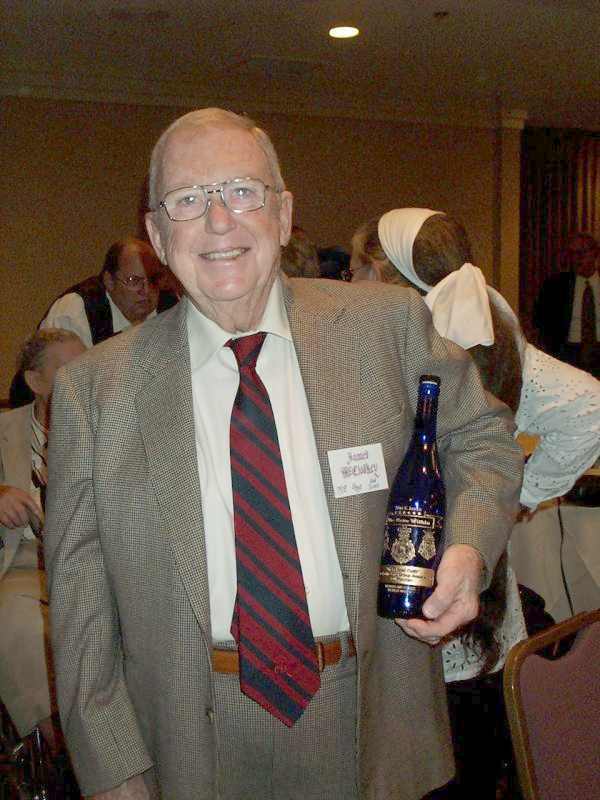 Jim McCloskey posed with his souvenir inscribed bottle at the Banquet. One bottle was awarded at each table.